This spring we launched our 2015 Anytime, Anywhere Work Survey to learn more about the adoption of flexible work programs inside CPA firms. We asked a number of new questions this year to learn more about how firms are successfully using technology to support their anytime, anywhere work programs. Due to overwhelming response and interest, we have devoted an entire blog to the subject. In a previous blog post entitled Why Offer Anytime, Anywhere Work?, we summarized the benefits and challenges of these types of programs. This blog will address some of those challenges and look at how technology can help mitigate the potential negative effects. Investigate new ways of communicating. To improve communication in your organization, bolster the methods staff have to stay in touch with one another. Some of you may be shaking your heads at me right now, since you find it hard to manage those systems (phone, email) you already have. However, the survey responses show that many organizations are using instant messaging systems, which can provide a more efficient and instantaneous way to exchange ideas. Here are the programs our survey respondents reported using. Use In/Out Boards to know when staff are available. In our work with CPA firms across the country, we commonly hear concerns about keeping track of the schedules for flexible work staff and knowing who is available when. 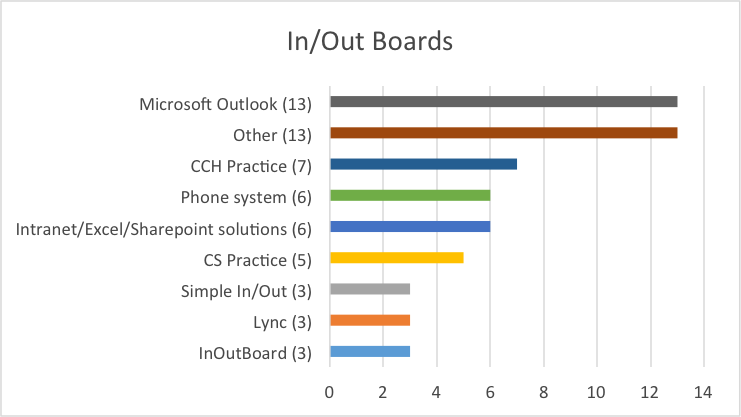 There are great software or web-based solutions for this, and as you’ll see, some of the solutions our survey respondents are using might be applications already available in your office. One of the challenges in working with anytime, anywhere employees is losing the ability to look at a paper file together or side-by-side at a computer screen. Again, technology exists that can mitigate this difficulty, and by the results of our survey, many of you are already using these tools, or have them available in your workplaces. Online file sharing. 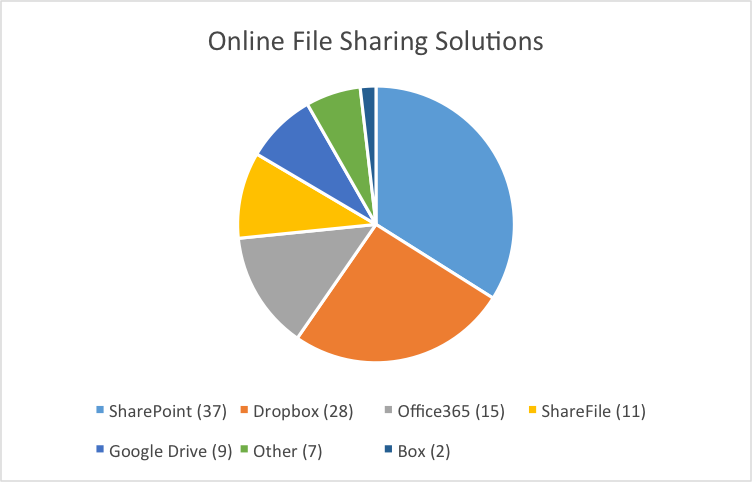 These solutions store your files in the cloud for access from anywhere and sometimes, any device. Some include the ability to work together real-time on documents and simultaneously see changes as they happen. Here are the programs our survey respondents reported using. 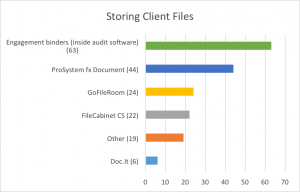 Storing client files electronically. 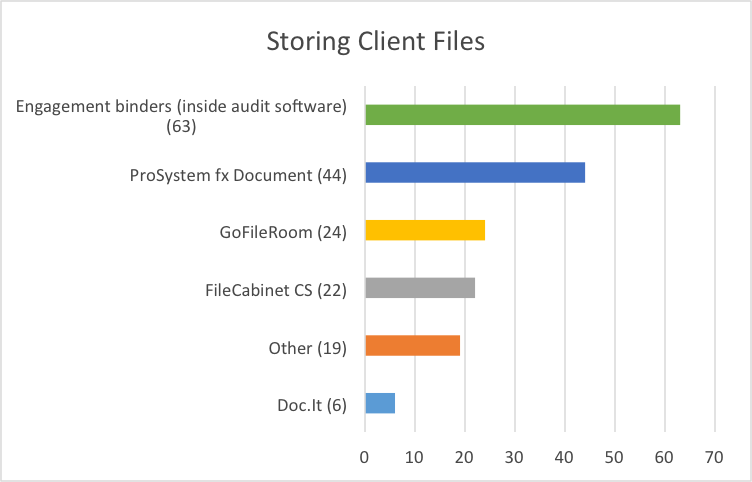 Whether you use a cloud-based solution or an internal network, storing your client files electronically is an essential first step in allowing staff to access those files from home and when on the road. Here are the programs our survey respondents reported using. 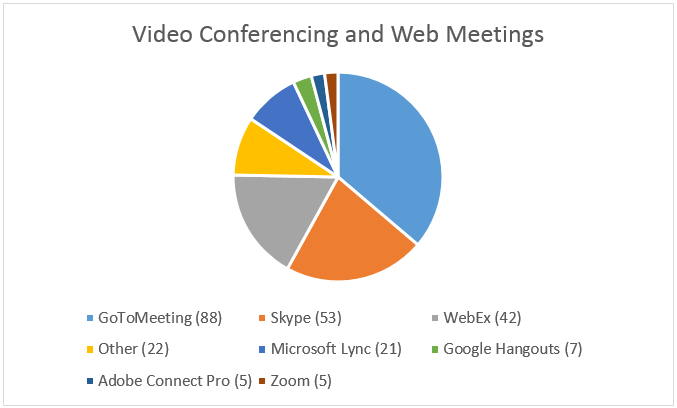 The second most cited challenge survey respondents had implementing anytime, anywhere work was that it “has highlighted technology issues we have,” noted by 20% of respondents. While technology is only one component essential to successful flexible work programs, it can be an impediment if it is not optimized for remote work, easy accessibility, efficiency and more. Make sure the performance for your remote systems is equal to, or better than, when using systems in the office to maximize productivity and encourage all team members to put in extra effort remotely when their schedules permit them to do so. Develop a consistent policy and approach to “BYOD” – bringing your own device to work. If your employees choose to do so, you need to have a program in place to clarify security and privacy requirements and other aspects to manage this type of “mixing” of equipment for work. 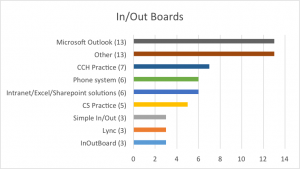 Read more about the pros and cons of this at http://www.cio.com/article/2396336/byod/all-about-byod.html. Consider a technology check out program to properly “outfit” your people when working remotely. Some firms enable their employees to check out multiple monitors, printers and other equipment to ensure that remote work is equally efficient compared to in-office efforts. Clarify reimbursement policies related to remote work. Be clear with your team on what your firm will and will not reimburse for related to internet and wireless connectivity from home or other remote locations. Many firms are now outfitting their “typically remote” team members with their own hotspot devices, which resolves the issue of at-home connections and can increase the security of the connections they make when working away from the office. Update (or initiate) your overall IT policies in light of the ongoing evolution of anytime, anywhere work. Many of these policies are “behind the times” and don’t take into account important ideas like ownership of data stored on personal devices, the importance of a secure wireless connection and more. For a sample IT policy, see http://www.shrm.org/templatestools/samples/policies/pages/cms_006400.aspx or https://www.sans.org/security-resources/policies/general#email-policy. Technology is an important part of your journey towards anytime, anywhere work programs that, when discounted, can create barriers to success. We are encouraged to learn more about how firms are using technology to support their flexible work programs and hope that these results will help your firm drive success in your anytime, anywhere work efforts, too! All product names, logos, and brands included here are the property of their respective owners. « How Does Your Firm Measure Success?